The more than 300 currently identified post-translational modifications (PTMs) provides great scope for subtle or dramatic alteration of protein structure and function. Furthermore, the rapid and transient nature of many PTMs allows efficient signal transmission in response to internal and environmental stimuli. PTMs are predominantly added by enzymes, and the enzymes responsible (such as kinases) are thus attractive targets for therapeutic interventions. Modifications can be grouped according to their stability or transience (reversible versus irreversible): irreversible types (such as irreversible redox modifications or protein deamidation) are often associated with aging or tissue injury, whereas transient modifications are associated with signal propagation and regulation. This is particularly important in the setting of heart disease, which comprises a diverse range of acute (such as ischemia/reperfusion), chronic (such as heart failure, dilated cardiomyopathy) and genetic (such as hypertrophic cardiomyopathy) disease states, all of which have been associated with protein PTM. Recently the interplay between diverse PTMs has been suggested to also influence cellular function, with cooperation or competition for sites of modification possible. Here we discuss the utility of proteomics for examining PTMs in the context of the molecular mechanisms of heart disease. Cardiovascular disease is the leading cause of morbidity and mortality in the developed world. It encompasses various acute and chronic etiologies, including vascular disease (such as atherosclerosis) and heart disease (including hypertension, ischemic heart disease, heart failure and the cardiomyopathies). Cardiac proteins are continuously synthesized and degraded to ensure proteome homeostasis and to generate necessary functions for satisfying the systemic demand for oxygenated blood. The state of the myocardium, which is predominantly made up of cardiomyocytes, dictates the balance between the synthesis and turnover of proteins that ensures that biochemical demands are met. An additional level of regulation involves signal sequences within proteins that mediate folding, trafficking to subcellular destinations and the formation of protein complexes. A still higher-order level of regulation consists of chemical and physical PTMs, and influences the physiological aspects of function and determines the half-life of proteins and their interactions with other proteins, ligands and DNA (Figure 1). Common localizations of specific post-translationally modified proteins within the cardiomyocyte. Post-translational modifications listed are: 1, phosphorylation; 2, N-glycosylation; 3, O-GlyN Acylation; 4, proteolytic cleavage; 5, redox; 6, deamidation; 7, sumoylation; 8, citrullination; 9, methylation; 10, lysine acetylation. PTMs act as a mechanism for precise tuning of the function(s) of proteins, typically by inducing conformational changes that subtly or dramatically alter the overall tertiary structure. Modifications vary in their ability to alter protein function; for enzymes, a PTM can either trigger or repress activity, meaning that function can be controlled without the need to synthesize new protein or degrade the existing pool. Such activity must be energetically favorable for the cell. PTMs can be broadly classed into three groups: enzymatic, in which the addition and subtraction of the modification is regulated by proteins; chemical, in which the modification is induced by changes in the local environment, such as cellular pH; and, less commonly, physical, in which proteins are targeted for cleavage or degradation, for example matrix metalloproteinases in extracellular matrix remodeling after myocardial infarction. It is estimated that 5% or more of the human proteome comprises proteins involved in enzymatic PTM . These include kinases, glycosyltransferases, acetyltransferases and others that add specific moieties to proteins, and their counterparts, such as phosphatases that remove these functional groups. Additionally, modifications can be induced by the action of proteases that cleave polypeptides to generate new functional subunits or degrade proteins, resulting in a loss of function. Furthermore, some proteins contain self-regulatory autocatalytic domains; an example is receptor tyrosine kinases, which are auto-phosphorylated following stimulation by a specific environmental trigger. The cellular pool of even a single protein can therefore be a dynamic mixture of its different modified and unmodified forms in various proportions , and thus substantial functional diversity can be generated in an often tightly regulated manner . Protein PTM is often the first response to an external stimulus, but aberrant signaling can also contribute to disease. PTM regulation can become dysfunctional through signal amplification or dampening or through abnormal 'PTM crosstalk' . The addition of a non-native PTM can alter a protein in two ways; firstly, it can lead to biochemical dysfunction, and secondly, it can cause crosstalk in which a native (and potentially functionally necessary) PTM cannot be added or removed because of steric hindrance caused by an inhibitory modification at a structurally proximal amino acid. The complexities of PTM in physiological and pathophysiological states are therefore of great significance. Analysis of PTMs on a large scale has traditionally been difficult because of their generally low abundance  and labile nature . Enrichment strategies, such as subcellular fractionation  and PTM-focused approaches have now been developed for many PTMs (Table 1), and these have been most successful when combined with the separation power of liquid chromatography and the sensitivity and resolution of mass spectrometry (MS) . These technologies have now provided a window into the ability of PTMs to decorate proteins. Many of these studies have thus provided vast in silico libraries of modified proteins and the sites at which modification can occur [7–13]. Several recent reviews have discussed the use of high-throughput techniques to resolve the contribution of the proteome to vascular disease [14–17]. We therefore focus here on the role of PTM in heart disease. Ψ indicates a hydrophobic residue. 2-DE, two-dimensional gel electrophoresis; IP, immunoprecipitation; LC, liquid chromatography; MS/MS, tandem mass spectroscopy; SDS-PAGE, sodium dodecyl sulfate polyacrylamide gel electrophoresis; TAILS, terminal amine isotopic labeling of substrates. A diverse collection of enzymatic and reversible modifiers of proteins exists, but for the purpose of this review we will concentrate on phosphorylation, glycosylation (N- and O-linked), lysine acetylation, sumoylation (via addition of small ubiquitin-like modifier (SUMO)) and citrullination (or deimination). Phosphorylation is now a well-characterized PTM, with many large-scale studies having been conducted in a wide variety of cell types and tissues since 2006 [13, 18–22]. Over 500 kinases are predicted to be encoded by the human genome , 200 of which have been implicated in heart disease [24–26], as reviewed previously [27, 28] (Table 2). The tools of phosphoproteomics are being used to define the targets of these kinases, including of novel kinases of poorly defined function  such as epsilon-protein kinase C, which protects animal hearts from ischemic injury . Hydrogen-peroxide-induced stress in rat cardiomyocytes has also been shown to induce an increase in tyrosine phosphorylation that is mediated, at least partially, by Src kinase . Phosphorylation can alter the conformation of target proteins, resulting in activation or inactivation of function. Current estimates suggest that as many as 500,000 sites can be phosphorylated on between 10% and 50% of the 23,000 proteins in the human genome . Addition of the phosphate group can also recruit (or repel) target proteins, allowing cascades to commence from a single initiator and environmental stimulus. 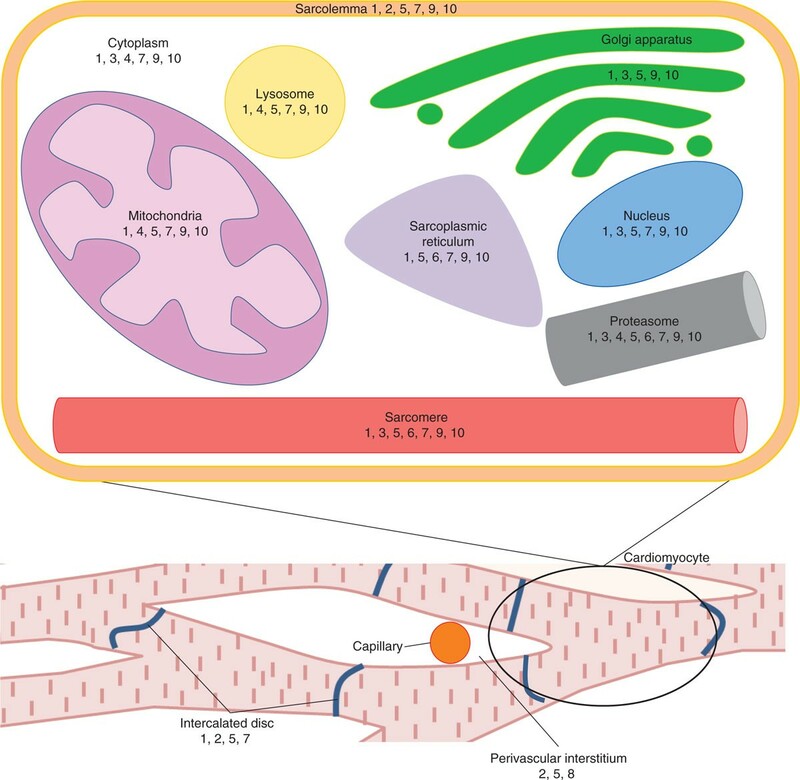 Such signal transduction pathways are crucial in acute cardiac pathologies, such as ischemia/reperfusion (I/R), or indeed cardioprotection where the time-frame for injury or protection is too short to be mediated by large changes in protein abundance. Therefore, specific kinase inhibitors (or activators) are of interest as interventions. The specific enrichment strategies used in phosphoproteomics have been reviewed extensively, with a focus on heart disease . Protein glycosylation, unlike many PTMs, refers to various different modifications of different mass and distribution rather than a single predictable type. Glycosylation can involve the addition of simple monosaccharides through to complex branching glycan structures comprising different individual sugar subunits. Its effects can include alteration or mediation of protein folding, protection against proteolytic degradation, defense against mucosal pathogens, cell-cell communication and adhesion, and immunity . Given the number of enzymatic steps required for the addition of sugar moieties, glycosylation is thought to be the most complex PTM, and thus presents particular analytical challenges (Table 1). Addition of glycans can occur en bloc (in which the glycan is synthesized and added to a previously folded protein substrate) or, more rarely, by sequential transfer of single sugars, one by one, to a nascent (or folded) polypeptide. In both cases, the sugars are attached by oligosaccharyltransferases or glycosyltransferases. Attached glycans can also be modified to add further structural diversity, including sulfation at mannose and N-acetylglucosamine (GlcNAc) residues in extracellular matrix proteoglycans, addition and acetylation of sialic acid, and phosphorylation, such as on mannose 6-phosphate to ensure correct trafficking to lysosomes . N-glycosylation is a complex biochemical process that is initiated in the cytoplasm, where sugars are synthesized from nucleotide-derived precursors and then transferred into the endoplasmic reticulum, where further glycan assembly occurs. Once the core 14-mer N-glycan is complete, it is transferred by an oligosaccharyltransferase to asparagine residues within the sequence motif Asn-x-Ser/Thr (where × is not proline). Further trimming and maturation, including addition and subtraction of sugars from the core glycan, occurs in the Golgi apparatus. Once complete, the nascent unfolded glycoprotein is generally transferred to the cell surface or extracellular space, and thus analytical techniques for the enrichment of N-glycoproteins are particularly efficient for capture of the plasma membrane sub-proteome . Changes in N-linked glycans have been observed in cardiac conductance disorders, in heart failure and during remodeling in response to myocardial infarction [36–38] (Table 2). Typically, however, N-linked glycosylation would not be expected to change significantly in acute cardiac pathologies, and it still remains unclear whether this modification has a role in chronic disease. Although little work has been done in this area, N-glycosylation of fibrillin-1 has been associated with the genetic defect responsible for Marfan syndrome, which results in valve and aorta defects . In addition, autosomal recessive dilated cardiomyopathy has been implicated as a congenital disorder of glycosylation in individuals with mutations in dolichol kinase, an essential enzyme in the biosynthesis of glycan precursors . These patients demonstrate N-glycosylation deficiency and abnormal mannosylation of the laminin-binding extracellular matrix protein α-dystroglycan. Additional diseases beyond the classical congenital disorder of glycosylation are now thought to exist . Proteomics, and glycoproteomics in particular, offers the potential to 'type' such diseases by using the diverse chemical properties of the various sugar moieties to determine those absent on a proteome-wide scale in these patients. Proteomic investigation of mammalian N-linked glycans can be technically challenging given the heterogeneity of the modification and the potential size of the PTM. Enrichment strategies allow the effective capture of glycopeptides [36, 42–44]; however, the labile nature of glycosidic bonds, and the generally large mass of the modification, renders tandem MS approaches problematic. The field is therefore often divided into two: release and study of the diverse glycan structures without reference to the proteins from which they were derived, and release of the glycan and analysis of the formerly glycosylated peptide(s). Key to identifying the site of glycosylation is the presence of the N-linked consensus motif and glycan release facilitated by protein N-glycosidase F (PNGase F), which liberates the N-glycan and 'tags' the former asparagine modification site by deamidation to an aspartate . The analysis of complex O-glycosylation has been comprehensively reviewed recently , and little to no information is available concerning a role for complex O-glycans in cardiac diseases [47, 48]. Despite this, potentially the best-characterized cardiac-associated PTM is the O-linked attachment of a single β-N-acetylglucosamine (O-GlcNAcylation) to serine or threonine residues of predominantly nucleocytoplasmic proteins. O-GlcNAc thus has the potential to compete with phosphorylation for binding sites . This has led to the proposal of O-GlcNAc-phosphate crosstalk (see below), although there are currently few examples of reciprocal regulation at identical sites and the functional basis (for example, which PTM is the positive and which is the negative regulator of function) for those that have been identified is generally not known. O-GlcNAc attachment and removal are mediated through the actions of O-GlcNAc transferase and O-GlcNAcase, respectively. 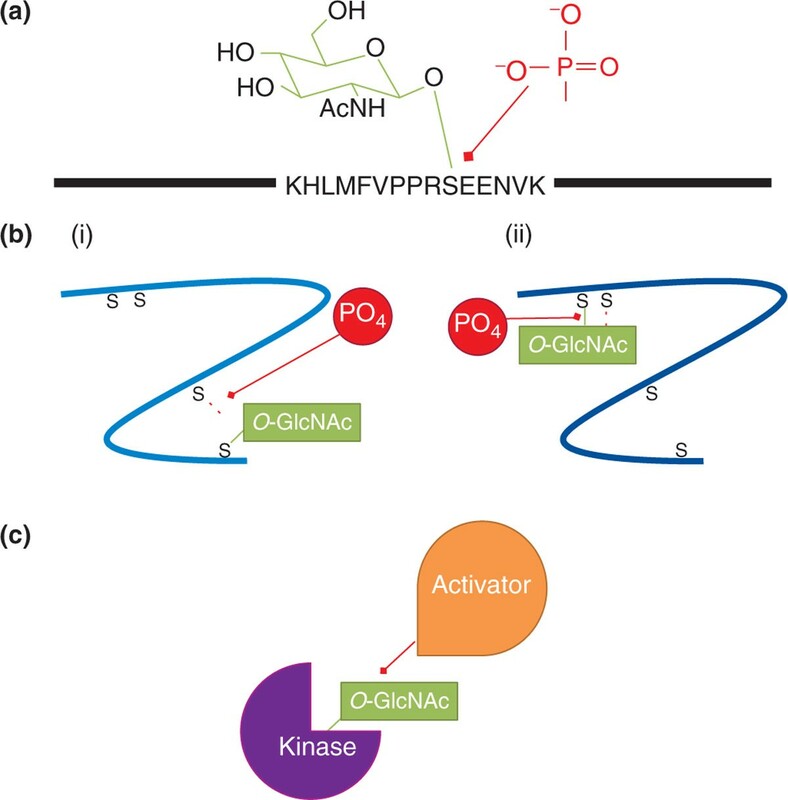 Unlike phosphorylation, for which many kinases and phosphatases act either specifically or in large cascades through signal amplification, these two enzymes are currently the only identified mediators of the O-GlcNAc PTM. O-GlcNAcylation has been identified as a PTM of proteins involved in nuclear transport, translation and transcription, cytoskeletal organization, proteasomal degradation, and apoptosis [50, 51]. Consequently, it regulates both positive and negative processes in the cardiovascular system  (Table 2). Transient increases in O- GlcNAc provide cardioprotection against myocardial ischemia [53–55] and alter the formation of mitochondrial permeability transition pores during Ca2+ overload . Conversely, the chronic increase of O- GlcNAc observed in diabetes has been linked with adverse cardiac symptoms, including hypertrophy  and contractile dysfunction . The physiological distinction between these elevations of O- GlcNAc may be related to interplay with phosphorylation . For this reason, proteomic investigations of O-GlcNAcylation use high-throughput approaches similar to those employed for phosphorylation (Table 1). Lysine acetylation is an enzymatic and reversible regulatory PTM that is added by histone acetyltransferases (HATs) and reversed by histone deacetylases (HDACs). It has been shown to influence gene expression, metabolic processes and chromatin remodeling [59–61]. Irreversible acetylation also occurs on the amino termini of many proteins. A major family of deacetylases is the sirtuins (SIRTs), which are class III HDACs that require NAD for activity [62–64]. The SIRTs have been closely implicated in both protection against and generation of cardiac disease [65–68] (Table 2). SIRT1 and SIRT7 protect cardiomyocytes from oxidative stress-mediated cell death and age-related degeneration . SIRT2 deacetylase inhibition is protective against I/R injury, because SIRT2 binds receptor interacting protein-3 (RIP3), which is part of a necrosis-promoting complex stimulated by tumor necrosis factor α . Conversely, however, SIRT1 inhibition ameliorates SIRT1-associated cardioprotection against I/R . It is clear that the SIRTs are crucial in cardiac diseases, although the mechanism of this action, and the proteins through which these phenotypes are mediated, remain largely to be determined. Proteomics approaches based on MS have recently begun to define the extent of lysine acetylation or deacetylation on a systems-wide level [7, 71], revealing a vast level of potential regulation on a scale comparable to protein phosphorylation. Evidence of crosstalk between these modifications through alterations to protein-protein interactions has also been observed . Targets of specific SIRT forms (such as SIRT3 ) are now also being investigated such that both the function of individual SIRTs and their associations with disease can be elucidated. Proteome-wide studies have typically used the specificity of anti-lysine-acetylation antibodies for protein or peptide immunoprecipitation, among other methodologies  (Table 1). Proteins modified with SUMO that is covalently attached to targets in an ATP-dependent manner include many regulatory proteins and proteins found in the nucleus and nuclear pore complex [74, 75]. Sumoylation is mediated by the activities of several enzymes, including the SUMO protease, activating and conjugating enzymes, and a SUMO protein ligase, responsible for SUMO addition. Sumoylation occurs in a consensus motif consisting of a hydrophobic residue (valine, isoleucine, leucine, methionine, phenylalanine, proline or cysteine) followed by lysine (the site of the attachment), then any amino acid and then glutamate or glutamine (Ψ-Lys-x-Glu/Gln); however, several examples of non-conforming sumoylation events and even examples in which the motif is reversed have been identified. Sumoylation seems to regulate several diverse activities, including the cell cycle, DNA repair, localization, chromatin remodeling and the heat shock response . The SUMO pathway is central in the regulation of cardiac gene activity and heart development , particularly in cardiogenesis  and ion channel modulation [79, 80], with defective sumoylation leading to congenital heart defects [81, 82]. SUMO1 deletion in mice and overexpression of the SUMO protease SENP2, which removes SUMO, both result in cardiac dysfunction and heart defects . In addition, modulation of sarco-endoplasmic reticulum Ca2+ ATPase 2a (SERCA2a) activity by SUMO1 has been demonstrated in heart failure . SERCA2a is sumoylated at lysines 480 and 585, in a process that is required for ATPase activity and stability of the protein . Sumoylation is significantly reduced in failing hearts, and downregulation of SUMO1 resulted in accelerated pressure-overload-induced deterioration of cardiac function accompanied by decreased SERCA2a activity . Sumoylation can be targeted through the use of anti-SUMO antibodies or hexahistidine-tagged or signature-tagged SUMO  in immunoprecipitation experiments coupled with MS  or western blotting of target proteins . His-tagged SUMO with an inserted carboxy-terminal tryptic cleavage site has also been shown to facilitate MS identification of SUMO-modified proteins  (Table 1). Finally, citrullination, or deimination, is the post-translational conversion of arginine to citrulline that is catalyzed by Ca2+-dependent peptidylarginine deiminases (PADs), of which there are up to six predicted in the human genome . Citrullination alters the structure-function relationship by changing the local charge and hydrophobicity from the basic arginine to neutral. Although our understanding of this modification is still in its infancy, an association with rheumatoid arthritis  has been established (and indeed tests for citrullinated protein can be used for diagnosis), and one or more PADs are either overexpressed or show increased enzymatic activity in other diseases, including multiple sclerosis (myelin basic protein can be citrullinated) and Alzheimer's disease (reviewed in ). Although limited work has been conducted on citrullination and cardiac disease outside the context of rheumatoid arthritis, a recent study by Giles et al. determined that PAD1 to PAD3 and PAD6 are expressed in cardiomyocytes, and that citrullination is increased in the myocardial interstitium of patients with rheumatoid arthritis. These authors  speculated that elevated citrullination might be a link between arthritis and heart failure that is more commonly observed in these patients. Analytical approaches with high resolution are needed to identify the targets of this PTM. Given that citrullination alters arginine, which is recognized by trypsin, there is scope to directly target the modification in high-throughput approaches. The state of the art in analysis of citrullination in combination with gel electrophoresis, MS and immunodetection has been reviewed recently . Some PTMs are irreversible and caused by chemical processes rather than being controlled by enzymes; the most frequently seen examples are glycation and deamidation. Glycation is the non-enzymatic process of sugar deposition onto proteins or lipids. In the absence of enzymatic control, glycation may have serious implications for the physiological function of proteins. Advanced glycation end products (AGE) not only indicate hyperglycemia, but also represent cumulative metabolic burden, oxidative stress and inflammation [92, 93]. Activated cell surface AGE receptors (RAGE) trigger downstream pro-inflammatory pathways by regulating cytokine production and transcription factors, and they also induce oxidative stress [94, 95]. Numerous kinase-regulated pathways also undergo co-activation with AGE receptor induction, including mitogen-activated protein kinases . AGE-modified proteins have been detected within myocardial fibers [97, 98] and the numbers of such proteins have been shown to correlate with the severity of coronary heart disease . A strong relationship between cardiac disease and overall AGE levels has been demonstrated, with elevated AGE content correlating with poor outcome as shown by adverse cardiac events in patients after cardiac surgery . AGE levels are also a strong predictor for heart failure and new cardiac events [101–103]. Enrichment of AGE-modified proteins before MS is of interest for the detection of new biomarkers  (Table 1). Deamidation is a non-enzymatic process in which removal of an amide converts glutamine and asparagine to glutamate and aspartate, respectively. Deamidation has long been suggested as a form of molecular clock because of its association with protein aging and lifespan . The best studied example of the importance of deamidation in protein function and lifetime is in the eye lens crystallins, which are long-lived proteins whose deamidation progressively occurs during life, resulting in aggregation and cataract formation . Deamidation is influenced by flanking residues, in particular the amino acid carboxy-terminal to the asparagine, which is commonly a glycine or serine . In cardiac tissue, deamidation events have not been studied in depth. Deamidation of the extra large Bcl-2 family protein, Bcl-X(L), was found to occur in wild-type mice after myocardial infarction and to sensitize cells to apoptosis through enhanced Bcl-2-associated × protein (BAX) activity. This deamidation was reduced in a dominant-negative mutant of the kinase p38, suggesting that p38 may promote cardiomyocyte apoptosis through Bcl-X(L) deamidation . Other studies have shown that deamidated myosin light chain 2 undergoes proteolysis during reperfusion injury post-ischemia between the deamidation site and flanking serine residue . Few other studies have been attempted, most likely due to the lack of a specific enrichment approach for this most neglected of PTMs (Table 1). Cellular processes including antigen processing, apoptosis and signaling use proteases to remove unfolded or incorrectly folded protein substrates, to generate subunits from precursor proteins and to remove potentially toxic functions . Because unregulated protease activity has the potential to be highly damaging, proteases are tightly controlled by sequestration into subcellular compartments, such as proteasomes or lysosomes, by translation as stable inactive precursors (zymogens), and/or by activity being limited to a specific pH range or in the presence of specific co-factors (such as Ca2+) . Disease processes resulting in incorrect localization or inappropriate activation can have dramatic consequences for the functional stability of the cell, and therefore many therapeutic targets are proteases . Of the more than 500 proteases in the human genome , more than 90% fall into one of four categories: serine proteases, cysteine proteases, aspartate proteases and zinc metalloproteases. In the cardiovascular system, proteases are involved in blood pressure regulation, coagulation and thrombosis, and inflammation, and have been associated with hypertension, heart failure and myocardial infarction [108, 111, 112]. Pathophysiological processes, such as necrosis, induce protease activity; for example, cardiac troponin I is proteolysed following acute myocardial infarction, with circulating levels of fragmented cardiac troponin I the gold-standard marker of irreversible damage in acute coronary syndromes. Identification of the targets of aberrant protease activity remains a technical challenge. Historically, two-dimensional gel electrophoresis technology was the most effective approach for visualizing cleaved forms of target proteins. In recent times, the development of terminal amine isotopic labeling of substrates (TAILS [113–115]) and amino-terminal oriented mass spectrometry of substrates (ATOMS ) has allowed the advent of 'degradomics', whereby identification of cleavage sites can be performed in a gel-free manner that is compatible with tandem MS. This amino- and carboxy-terminal degradomics approach has been used to identify new substrates of proteases, in particular of matrix metalloproteinases [117–119]. Reactive oxygen and nitrogen species (ROS and RNS, respectively), which are generated as a byproduct of many biochemical processes or as a result of environmental oxidative stress, cause specific and both reversible (signaling) and irreversible (oxidative damage) oxidative modifications of biomolecules, including proteins, lipids and DNA. I/R is thought to be an ROS-associated disease because of the large influx of free radicals seen in the first 5 to 10 minutes of reperfusion . Although almost all amino acids can be redox modified, the most likely target of both reversible and irreversible modification is cysteine . Cysteine residues can be oxidized to intra- and inter-protein disulfides or reversibly over-oxidized to cysteine sulfenic acid, both of which are recovered by the actions of reductases; and they can be irreversibly oxidized to cysteine sulfinic and sulfonic acids, which impede protein function and may target proteins for degradation. ROS are derived from many sources, both intracellular and extracellular, including NADPH and NADH oxidases, which generate signaling ROS for the regulation of cell differentiation, proliferation, migration and survival in the myocardium [122, 123]. Other major sources of ROS or RNS in the heart include the mitochondrial electron transport chain, metabolic enzymes, and nitric oxide synthases . Redox regulation mediates both detrimental processes  and protective cellular pathways . ROS signaling in the myocardium has been extensively reviewed [123, 126–128], but an equally significant role has been suggested for RNS generated by nitric oxide and peroxynitrite . S-nitrosylation is a reversible, labile PTM that occurs on free cysteine and is thus thought to be an important regulator or redox switch [130, 131]. Reversible cysteine modifications, predominantly disulfides, cysteine sulfenic acid and S-nitrosylation, can be enriched at the protein level through the use of the biotin-switch assay  or thiol disulfide exchange chemistry . Although individual PTMs are clearly crucial in mediating protein structure-function relationships, until recently the potential for different modifications to influence each other through cooperation or competition had not been explored. Such PTM crosstalk has the potential to act as a completely new level of cellular regulation, allowing rapid changes in function without the requirement for genomic activation. The basis for crosstalk includes three levels (Figure 2): competition for the same site; modification that changes the structure to make a second site accessible or inaccessible to the modifying enzyme for another PTM; or direct modification of the modifying enzyme of the second PTM (such as O-GlcNAcylation of a kinase activating or inhibiting function). Crosstalk has been explored in histones as part of the chromatin code , but it is evident in many other biological systems. One of the first examples of potential PTM crosstalk came in examining the potential sites of O-GlcNAc or phosphorylation modification, because both PTMs target serine and threonine residues . When taken with the fact that both are dynamic and transient, it is tempting to hypothesize that these PTMs compete for sites of regulation. However, the extent of interplay and the regulatory mechanisms behind such crosstalk remain elusive [134, 135]. Superficial elevation of O-GlcNAcylation with the addition of multiple O-GlcNAcase inhibitors in mouse embryonic fibroblasts resulted in reciprocal regulation of phosphorylation at over 400 sites (280 of which showed reduced phosphorylation), providing evidence for crosstalk or competition between protein kinases and O-GlcNAc transferase . Adding a further level of complexity to the relationship between O-GlcNAc and phosphate is the recent discovery of a single O-GlcNAc-6-phosphate modification  that can be attached to multiple proteins . Proposed models for the influence of post-translational modifications crosstalk on protein function, showing O -GlcNAc and phosphorylation as an example. Crosstalk may occur by: (a) competitive occupancy: O-GlcNAc occupies a serine, making it unavailable for phosphorylation; (b) steric hindrance from proximal modification that blocks the alternate modifying enzyme from accessing a site located either (i) nearby in the secondary structure or (ii) nearby in the tertiary structure; or (c) modification that regulates the other's enzymatic machinery (O-GlcNAcylation of a kinase prevents auto- or kinase-based activation). Crosstalk between other modifications has also been suggested, for example between sumoylation and phosphorylation. Large-scale sumoylation investigations showed the lysine site of SUMO attachment spaced four residues from a phosphorylated serine in a significant proportion of the sumoylated proteins [139, 140]. Phosphorylation and lysine acetylation also seem to crosstalk, for example AMP-activated protein kinase and the SIRT family . Crosstalk may also be a signal for degradation: in I/R injury, myosin light chain 2 is degraded between a phosphorylated serine and a deamidated asparagine, showing that three PTMs can occur within two amino acids of each other . The widespread nature and diversity of protein PTMs and the sheer number of enzymes encoded within the human genome that are predicted to modify proteins strongly implies that there is a level of previously unknown regulation within cells. We have concentrated here on only a handful of reasonably well-characterized PTMs and those that seem to be of emerging significance in cardiac disease, but it would be equally possible to discuss additional modifications, such as arginine and lysine methylation, mediated by protein methyltransferases and demethylases (reviewed in [142–144]). Ubiquitination alone could be the subject of several reviews (a role in myocardial ischemia has been reviewed recently ). High-throughput and high-resolution proteomics approaches have facilitated the discovery of these modifications and added large swathes of site-specific information to protein databases. We consider that PTM crosstalk will eventually be viewed as a complex and directed regulatory mechanism used by cells in a manner analogous to microRNA post-transcriptional regulation. The potential for elucidating these mechanisms will further aid in our ability to understand cellular mechanisms of disease and provide targeted strategies for disease intervention. This work was facilitated by grants from the National Health and Medical Research Council (NHMRC) of Australia. MYW is the recipient of an Australian Research Council Discovery Early Career Research Award (DECRA). KAL is the recipient of an Australian Postgraduate Award.